I do love me some angry, industrialized Teutonic metal à la Rammstein, Megaherz, and Eisbrecher. Can't get enough of it. A band within this style that I had not heard of, until now, is the nicely named Nachtblut from the Lower Saxon town of Osnabrück. Formed in 2005, the band quickly amassed a rather respectable following and self-released two full-length albums, the latest of which is 2009's Antik. Napalm Records recently signed the band and has remastered, repackaged, and re-released their sophomore effort. 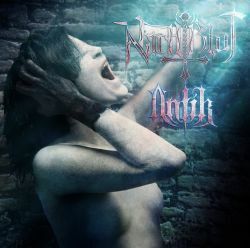 Nachtblut sits firmly within that style of metal sometimes referred to as Neue Deutsche Härte, which consists of driving industrialized riffs, Gothic synth-laden ambiance, and angered German lyrics (though pretty much anything said in German automatically comes across as angry). While the frontmen for most bands of this subgenre typically sing their lines in a deep baritone, Nachtblut's Askeroth bucks the trend with his gurgling blackened shrieks. For the most part, I found his harsh vocal approach seemed to do more to separate him from the band's overall style rather than compliment the tone of the music. The warm, memorable synth-driven melody of the title track, for example, contrasts sharply with Asteroth's snarls. This dissimilitude doesn't come close to derailing the album, however, but was for me merely an annoyance. I did find the band's overall sound to be highly enjoyable and filled with lush, but never overplayed, synth elements from the alluring Lymania. Her sometimes haunting, always moody contributions provide an appropriate backdrop for Greif's chugging riffs and slightly flashy licks. Said riffs are predominantly of the simple sort, quite familiar to fans of both industrial and Gothic metal. The title track, as well as "Ijobs Botschaft" and "Die Blutgräfin", are prime showcases for Grief's basic but enjoyable style. While Nachtblut's sound may not be the most original, it's certainly enjoyable. "Sturz Des Ikarus", with its unusual but catchy chorus, and the very Rammstein-like "Hexe" bring the infectious riffing to addictive levels while the dark, menacing keys of "Kreuzritter" and the bombastic refrains of "Ijobs Botschaft" definitely hold attention. Though not groundbreaking, Antik is surely an album that deserves investigation by any fan of industrial and Gothic metal.